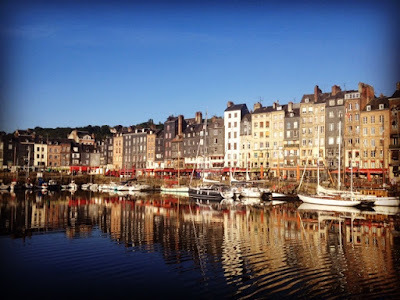 We spent the past few days in the charming port city of Honfleur, in Upper Normandy. Apparently, someone named Monet also spent time here and drew a few pictures. I don't know if Monet made the town famous or the the town made him famous. But I'm hoping the town has some magical effect on those pursuing a career in the creative arts. If I'm famous soon, we'll know it worked. We stayed in a rustic, old apartment with a private courtyard. By rustic, I mean a little dusty with the occasional bug stopping in for a visit. But it was a nice place and despite its small size, I'm sure it will seem like a mansion once we check into the tiny flat we've reserved in Paris. Honfleur is definitely worth the cost of a train ticket! The tiny, curved streets of narrow buildings with exposed timbers takes one back a few hundred years. I would have liked to live back then and apply for the job of town crier. That would be much better than plague body remover. Unlike other places where you often look for a specific scenic attraction, in Honfleur the town itself is what you come to experience. Although some of it is certainly touristy, much is still traditional and welcoming. On Sunday morning, we hiked up to Côte de Grâce, which sits on a short hill with a good view of the town and the Seine River. There's a monument on the hill honoring Her Lady of Grace for her protection during the Normandy Invasion when many other towns were destroyed. We also came across a small chapel on the hill, Notre-Dame de Grâce. It had no bell tower, and instead they built a bell rack next to the church. We happened to arrive at noon just as the bells began their concert. It was fun to actually see the bells rather than just hear them up in a distant tower. We are very much tourists here. We take pictures of doorknobs and mailboxes. But it's still fun to be a part of the culture and meet new people. As we ate dinner one evening, a young man sitting next to us turned around with a look if curiosity on his face. He was of Chinese descent and surprised to hear Mandarin and American English spoken with native accents. His Chinese name has a great English translation—Iron Breaker. I think he's actually a super hero in disguise. I'm a little sad to leave the peaceful countryside and head back to the noise and busyness of Paris. But we've reserved an apartment, so we're on our way. I'm just glad it's by train, not another claustrophobic plane.